It’s that time of the year again. Public service 2019 is starting with the YuKanRun Twin Lights on April 27, 2019. CAARA has a great public service team. Come out and have some fun with us. Why? You are using Amateur Radio to provide a needed public service to ensure the safety and smooth running of a public event in local communities. “I would but I do not have a radio.” No excuse, we have loaner radios available with a magnetic mount that will work in your car just by just plugging it into the cigarette lighter socket. We have loaner hand held radios as well! “I don’t have transportation.” No excuse, we will pick you up and drop you off at your house. “I do not have the time to spare for a whole race.” Well, you can commit to a time slot for just two hours. We will bend over backwards to get you to participate. 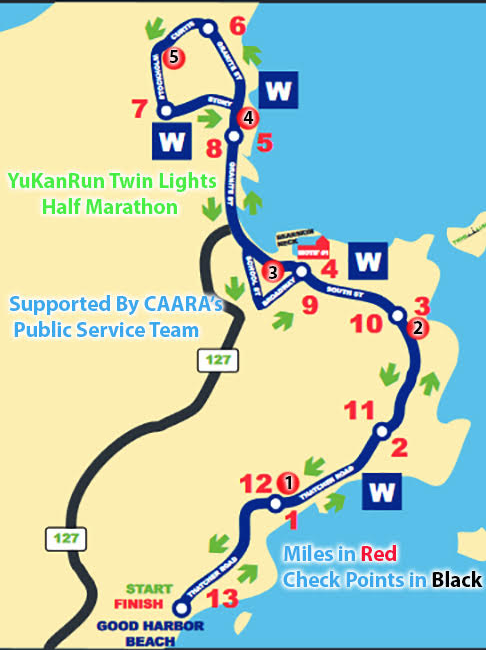 YuKanRun Twin Lights Half Marathon. Good Harbor Beach April 27, 9:00am Half Marathon Start Thatcher Road, Gloucester, MA. Please let us know what type of equipment you plan to use ( mobile; HT; ¼-wave mag mount; rubber duck, etc.) so we have a better idea of where to locate you along the event course per the potential of your equipment. 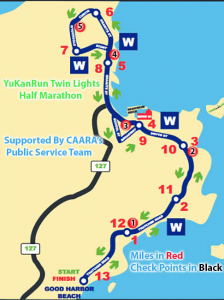 The course will be open and supported by CAARA for four hours. Runner safety is everyone’s top priority. Local EMT crews and ambulances will be available for three hours to help. Gloucester, MA. Good Harbor Beach.